In our poetry news roundup today we revisit the story of the Russian poet facing a prison sentence that we brought you yesterday. We also have a story about a memorial in Shrewsbury to one of the Great War poets. In yesterday’s poetry roundup we brought you the story of the Russian poet Alexander Byvshev who was under threat of a lengthy prison sentence for his poem “On Ukraine’s Independence”. We can confirm that whilst he has managed to avoid time in prison he has been convicted of “Inciting hatred” and given a 330-hour community work sentence. He has also been banned from teaching for three years. 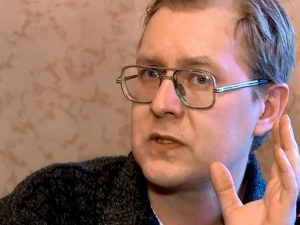 This may not, however, be the end of Byshev’s brush with the law, just last week he claimed on his Facebook page that the authorities had opened a new case against him. This time the subject was two short poems which he had written mocking the waste pollution of the city of Oryol, his home town. He also scoffed at the citizens for their lack of culture. It is hoped that the words of one of a famous Shrewsbury poet could soon be seen by many as part of a tiled mural in the railway station in the town. A local consortium of artists is hoping to create a mural to commemorate Wilfred Owen, the World War One poet. The mural will be installed at the front of the Victorian station in one of the brick arches where it will be seen by around two million passengers annually. 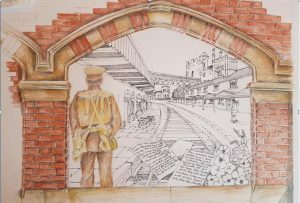 The subject of the mural will be “The Send Off” Owens famous poem which describes a train departing to take soldiers to the trenches of the First World War, how it affected their families and the significance this had for the troops. The mural will form part of the work that Shrewsbury Heritage is undertaking with Shropshire Archives, during which they hope to put on 100 days of commemorative events for World War One. These events are planned to culminate with the 100thanniversary of the death of Wilfred Owen 4thNovember 1918. As well as a soldier, the mural will also feature a deserted station with Shrewsbury Castle in the distance. On the rail tracks will be pieces of paper with The Send Off written on them. The mural is expected to cost around £18,000 to complete and the people involved in its creation are now working to a tight deadline in order to get it completed on time. They need to raise £15,000 from public donations in order to be able to complete the project. They are now appealing to anyone who would like to commemorate Owen, or indeed anyone who lost a relative in the trenches during the Great War to consider giving a few pounds to help them realise what they believe will be a very fitting memorial to one of the Great War poets.